FREMONT, CA, January 30th, 2018 - CORSAIR®, a world leader in PC gaming peripherals and enthusiast components, today announced the release of the new CORSAIR K68 RGB water-resistant mechanical gaming keyboard. Equipped with 100% CHERRY MX RGB keyswitches, every key on the K68 RGB is individually backlit and programmable, giving PC gamers virtually unlimited lighting customization in a vivid array of colors. Every keyswitch is also individually shielded from dust and liquid spills to an IP32 protection rating, defending against accidents so that gameplay never has to stop. Loaded with extras, from a removable wrist-rest to dedicated multi-media keys, and fully programmable with CORSAIR Utility Engine Software, the CORSAIR K68 RGB offers ultra-durable RGB gaming. The new CORSAIR K68 RGB Mechanical Gaming Keyboard is available immediately from the CORSAIR worldwide network of authorized retailers and distributors as well as direct from the www.corsair.com webstore. The CORSAIR K68 RGB Mechanical Gaming Keyboard is backed by a two-year warranty and the CORSAIR worldwide customer service and technical support network. 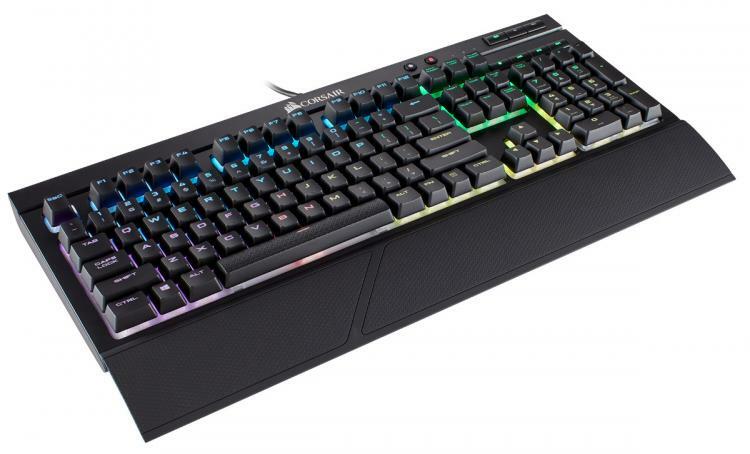 For more information on the new CORSAIR K68 RGB Mechanical Gaming Keyboard please visit: - http://www.corsair.com/k68rgb.